It’s Different This Time. Really! Commodities staged a rebound on Tuesday. The Thomson Reuters/Core Commodity CRB Index – an equal-weighted benchmark tracking 17 diverse futures contracts – bounced above the 200 level for the first time in six weeks. Being equal-weighted, the CRB index weights gold more heavily than other commonly followed commodity indices. Gold price caught a bit of bid recently; that’s true enough. So much so that pundits have begun talking up a rebound. If you look at spot metal prices through a longer lens, you’d likely think they’re mad. After all, spot metal’s gained a mere .6 percent since the end of August. Still, there’s no doubt something’s about to break in the gold market. Take a look at the chart for the SPDR Gold Shares Trust (NYSE Arca: GLD). You can see a symmetrical triangle pattern in GLD’s closing prices. There’s a similar triangle in the MACD (Moving Average Convergence Divergence) indicator, though overhead resistance goes back to May. No, the analysts are really talking about a turnaround in gold mining stocks. That’s where there’s been movement. The Market Vectors Gold Miners ETF (NYSE Arca: GDX) has jumped more than 11 percent in the last month-and-a-half. GDX tracks nearly three dozen global gold producers. The chattering class bases its bullish conclusion on the notion that gold miners are barometers of changing conditions in the bullion market. Well, conditions have changed. Some miners, after suffering crippling losses, have cut back production. 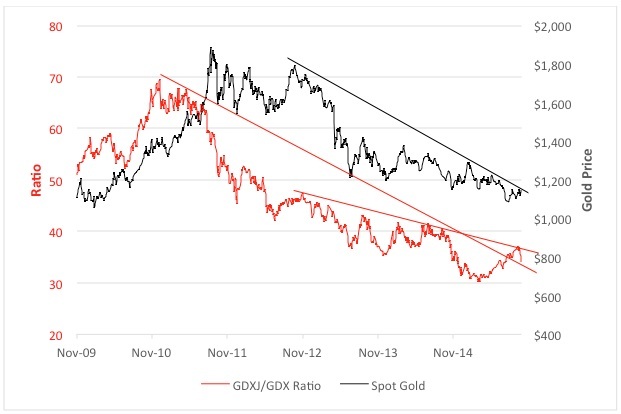 But the real precursor of tectonic shifts in the gold market has historically been the differential performance of GDX and its sibling, the Market Vectors Junior Gold Miners ETF (NYSE Arca: GDXJ). GDXJ benchmarks the exploration and development (E&D) market and is made up of more than 50 issues. GDXJ companies look for gold; GDX outfits actually sell the stuff. You could say the GDXJ/GDX ratio measures the speculative risk appetite of gold investors Think of GDX companies as the blue chips of the mining business; GDXJ components are the venture capital enterprises. Regard the drop-off in the miners’ ratio in December 2010. The slowdown in speculative momentum anticipated the top of the bullion market by some ten months. The ratio’s been in a downtrend since then, but recently showed signs of a rebound. Well, maybe. As you can see from the chart, the cup-and-handle bottom seems to have failed. On a more granular level, GDXJ – the speculative issues – are lagging as GDX – the revenue producers – are climbing. The miners ratio seems to be saying that gold investors are de-risking now. So, will history repeat? Does the falloff in the miners’ ratio signal another gold fail? All that can be said about miners is that speculative ardor is cool. The little guys, feverish buyers of “cheap” E&D issues a few years ago, haven’t yet been fully convinced of gold’s prospects. We can see that in the gold futures market as well. Small speculators went net short in July and have stayed so. We’ve all have heard that small investors always get things wrong…that smart money fades the odd-lot guys. Perhaps it’s good to keep this in mind. Meantime, keep an eye on the $1,150 level for spot metal. A weekly close above $1,156 would signal a bullish breakout and a market reset. Brad Zigler is REP./WealthManagement's Alternative Investments Editor. Previously, he was the head of marketing, research and education for the Pacific Exchange's (now NYSE Arca) option market and the iShares complex of exchange traded funds.